Of all the opponents in the battle against cancer, glioblastoma (GBM), an adult form of brain cancer, is among the worst. Treatment can look initially successful, but often within months, when this “honeymoon” period ends, patients are back with a recurrence. “The sad thing about this tumour is that it’s not curable and there are almost no survivors,” says Dr. Sheila Singh from McMaster University in Hamilton. The average lifespan for a GBM patient, she says, is just under 15 months; the five-year survival rate hovers around 1-2%. Dr. Singh, though, is more optimistic than most. She is working on what she calls a “new weapon” in the armory against recurrent GBM – a treatment that uses the body’s immune system to attack recurrent GBM. “There’s a very good chance we can treat recurrences in the future,” says Dr. Singh. The majority of research to date – 80-90% of the existing literature – has focused on primary GBM. This is, Dr. Singh says, a function of working from what is available – tumour samples taken during surgery as part of the treatment for primary GBM. (Chemotherapy and radiation make up the triad of standard treatment.) But even at McMaster, where surgeons are more aggressive than in most other centres, only 20% of recurring GBM patients receive surgery and, says Dr. Singh, these are not representative of all whose cancer recurs, but only the best and strongest patients. So the first hurdle she had to overcome was to get samples of recurrent tumours, which are biologically very different than primary tumours and much more aggressive. The solution she developed was to implant cancer stem cells – the hardest-to-kill cells – from the primary tumour samples in immunosuppressed mice. When they developed GBM, she treated them as she would a human and waited for the recurring tumour to develop. These mice-grown ‘recurrent’ samples could then be validated against samples taken from humans during the recurrent surgery. “Our model provides a biology we never could get from humans,” says Dr. Singh. 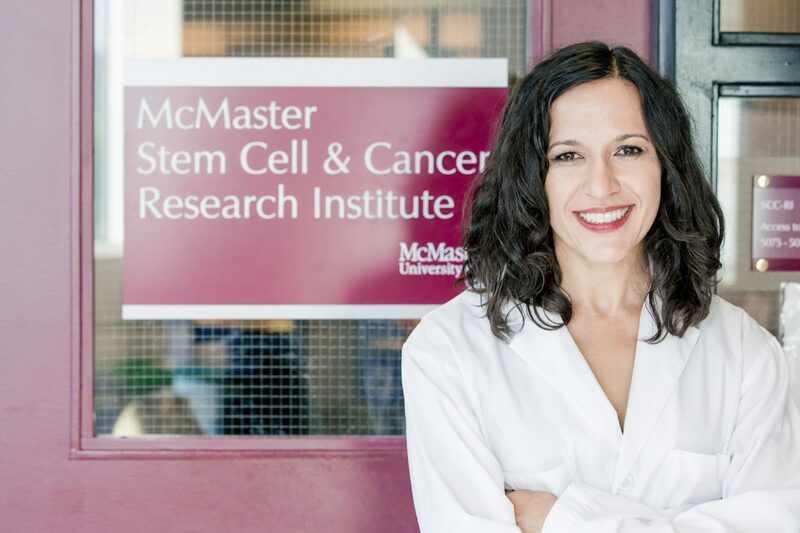 That enabled her lab to have unique GBM cell lines, not commercially available, says project scientist Dr. Parvez Vora, a member of Dr. Singh’s lab, and to analyze the recurring tumour to identify targets for treatment – in this case, a protein called CD133, whose receptors were found on the surface of recurring tumour cells. The next step was to find an antibody that would attack CD133. That’s where Singh’s collaborator, Dr. Jason Moffatt of the University of Toronto, entered the picture. He has developed a bispecific antibody – one with two binding arms, one of which attaches to a CD133 receptor and the other to a T-cell receptor. The antibody, called a BiTE (bispecific T-cell engager), or as Dr. Vora calls it, a “bridge between cells”, would connect the two together so the T-cell can attack and kill the cancer cell. The third challenge was to determine how best to deliver the antibody, the focus of the BioCanRx Catalyst grant. That’s the route Dr. Singh is investigating. If it is successful, it will help to lower the risk of systemic toxicity and avoid other, healthy cells that also have CD133 receptors being affected. So Dr. Singh is experimenting with delivering the antibody directly into the brain during surgery, or implanting a reservoir under above the skull and under the scalp through which the antibody could later be delivered. She is also tracing the route the BiTE takes through the body on its way to the brain – something she says too few studies actually do, validating if their therapy is actually reaching its target and efficiently killing the tumor cells. To do that, she attached a radioactive label to the antibody to study how it moved through the mice’s body to the brain and through the blood-brain barrier – a process known as PK/PD (pharmacokinetics and pharmacodynamics). With these three challenges being addressed, Dr. Vora foresees phase 1 clinical trials in humans beginning as early as 2019. And while this is the goal of the grant, there is a bonus as well. GBM tumours are heterogeneous, particularly recurring tumours – no two patients’ tumours are going to be identical. So Dr. Singh sees this as an ideal task for personalized medicine, using her mouse model to grow a recurring tumour based on the primary tumour sample and from that determining which combination of treatments will work best for a given patient. A two-for-the-price-of-one response to a deadly cancer.